Narali bhaat or Sweet coconut rice pudding is a rice dish from the western Indian state of Maharashtra. It is known as Narali Bhat in Marathi as 'Naral = Coconut' and 'bhat = rice'. Narali bhat is made on 'Narali Pournima' day, a 'Coconut festival day' which falls on a full moon day in the rainy season, mostly in August. It is a festival for the Koli (fishermen) of the western Indian coast who worship the sea on that day as the sea provides them their livelihood. 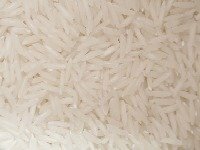 You can use long grained basmati rice or any other rice of your choice. Basmati rice adds a flavor of it's own to this rice. 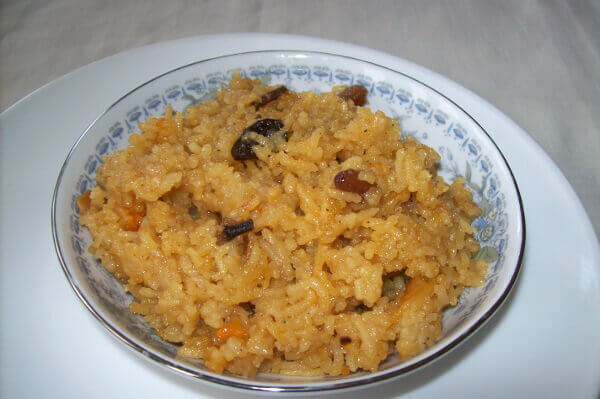 Traditionally, this rice is made with jaggery(brown sugar). You may substitute jaggery with sugar if you wish. I always prefer to make it with jaggery. Jaggery adds it's own flavor and color to the dish. 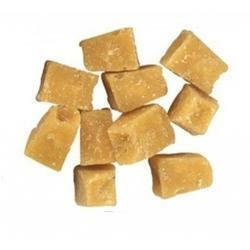 Jaggery is healthier than sugar and gives a wonderful taste as well as color. This recipe uses grated fresh coconut. 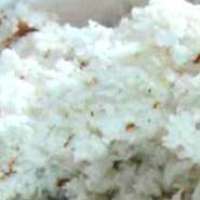 If fresh coconut is not available, you may use desiccated coconut. If Soak it in a little warm water 10-15 minutes before using. Sugar or grated/powdered jaggery - 1 1/2 cups (more or less according to taste). Wash rice, drain and keep aside for 1 hour. If you are using desiccated coconut, soak that in warm water. Heat ghee in a deep pan. Reduce heat to minimum. Add cashew nut pieces and fry a little. Remove and keep aside to add later. Add cloves to the same ghee. Fry for a few seconds till you get the aroma. Add drained rice. Fry for 2 minutes on low flame. If using basmati rice, handle with care. Add 2 cups water and cook the rice till just done. Add grated jaggery and grated fresh coconut. Mix well. Cover and cook for 10 minutes on low flame. Add the cardamom powder, cashew nut pieces, raisins and mix well carefully. Don't let the rice get mushy. Sweet coconut rice pudding or Narali bhaat is ready. Keep covered till serving time. You may also make a syrup with jaggery or sugar with a little water and add it to the rice when it is just cooked. If the jaggery or sugar contain any impurities, making syrup and straining the syrup to remove impurities is better. Using ghee gives good flavor and taste. If vegan, you may use coconut oil or any other vegetable oil instead of ghee.